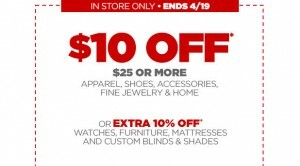 You can take an extra $10 off your $25 purchase at JCPenney today through Saturday (4/19) with this coupon. Coupon is valid on regular, sale and clearance items. Click HERE for details and to print it. This entry was posted in Coupon and tagged coupon, JCPenney. Bookmark the permalink. ← Win a Basket of Baby Food!